Playing The Agenda with my daughter. 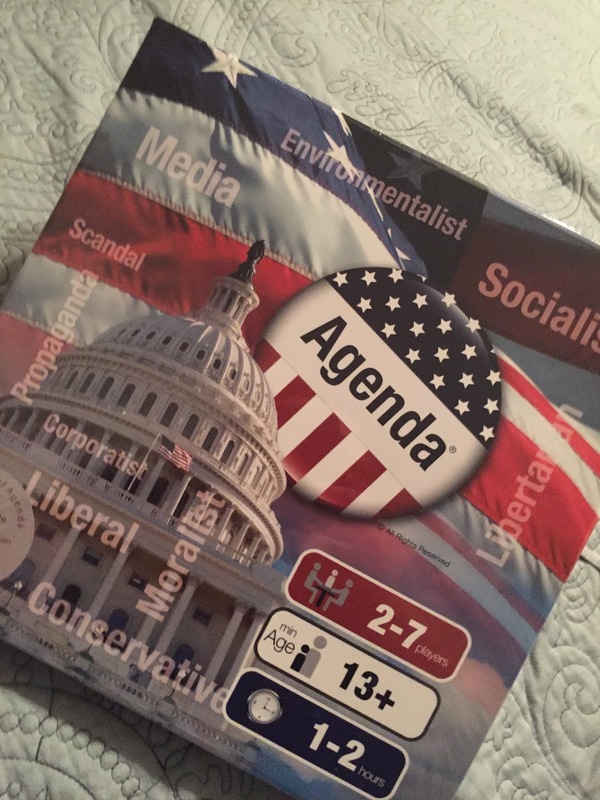 This political based game gives you a chance to gather enough votes to get your agenda passed. It takes some time to learn the ins and outs of the game but it is a great way to introduce kids to politics. In The Agenda you become the presidential candidate. You can choose from 7 political parties in this race for the white house. Before the start of the game you receive $500,000 in seed money, an approval rating of 50 and planks to help you showcase your votes. The game wasn't an easy start and we are still learning. The game comes with instructions but I felt like I needed to be a candidate to understand how it really worked in the beginning. Basically, you gain votes and money on by landing on spaces around the board and reading the card you draw which can either help or hurt your race. Some of the cards are political trivia with high rewards if you answer correctly. This is an interesting game and when I offered it to the Student Council at the Middle School in my town they were very excited. The teacher who leads the council can't wait to play with the council and thinks this will be fun with the new elects who just took their seats at the Middle School this past week and especially after the past Presidential debate. I can't wait to hear what she thinks of it.